Not long ago I was in the yard doing crossword puzzles when I saw Murphy standing in the ivy, head in a bush, tail wagging. NOT a good sign. I crossed the yard. He turned around happily and in his mouth was a wriggling brown thing. I asked him to put it down, and he did, very gently. I shoofed the dog into the house and grabbed some gloves and a towel. The little guy wasn’t hurt. But he was dazed and covered in dog slobber. I dried him off and he started to slowly stumble to his feet. 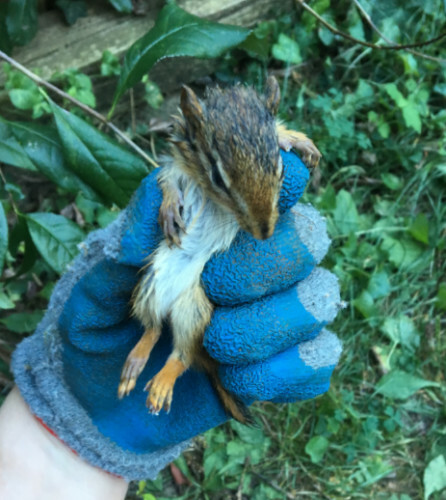 I carefully picked him up and put him on the other side of the fence, in the yard of the neighbor who doesn’t have dogs. The little chipmunk quickly scrambled away. But Murph wasn’t very happy that I took his new pet away. Three cheers for suburban life! My dog has a squirrel that torments him to no end. The squirrel will sit up in the tree and bark at the dog and also run across the top of the fence. I don’t know that our ending will be quite so happy if he ever manages to catch him.